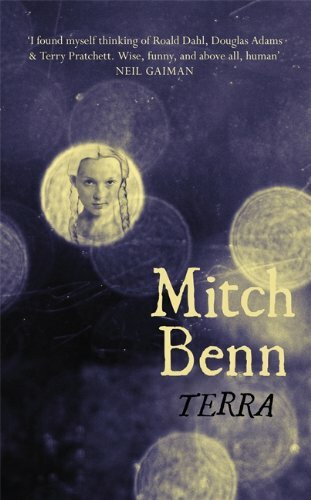 There's a good chance that if you're thinking of reading Mitch Benn's Terra , it's because you're familiar with Benn as a songwriter and performer on the BBC radio program The Now Show . While that's certainly a lure the publishers would be foolish not to publicize, you should probably decouple this satisfying little novel from any notion of the celebrity book deal. Snooki's A Shore Thing this isn't. With his strong body of song lyrics and stand-up, Benn is, in an obvious and important sense, a writer by trade. Terra deserves to be read as though fiction were his primary genre, rather than with the raised eyebrow rightly given to the blatantly brand-building celebrity cookbook and its ilk. Terra begins with an alien abduction, somewhat by accident. A scientist named Lbbp witnesses, or so he thinks, two human parents willfully abandoning their infant. He takes the girl (whom he later names Terra) home to his technologically advanced world, Fnrr, to live with him. The novel follows Terra's near-simultaneous entrance into something like junior high and the cultural and political upheavals on Fnrr. This makes it sound as though the novel is a simplistic teen-girl power fantasy a la Nancy Drew (why did they keep letting this high-schooler interrogate career criminals? Why did it work ?) in which the events of your youth are as important to everyone else as they are to you. However, Terra's involvement in world affairs is for the most part gracefully handled rather than grating. In fact, the novel flows with confidence between the personal and the interstellar-political. The primary and secondary characters are well established and generally engaging, even ( especially ) when they're somewhat irritating people (everything with the unexpected heroic arc of sneering bureaucrat Vstj is gold). The whole book is eminently readable, lending itself to being consumed at a cracking pace. The craft-level of the work is mature and sustained. I have to admit my eyebrow was doing a bit of a celebrity cookbook "oh really?" at the jacket's promise that Benn was "like [Douglas] Adams and [Terry] Pratchett." The name-recognition factor and general audience appeal of these two men have ensured that I have heard similar things said of any book-writing bloke both British and breathing. But, while I'd incline more towards Adams than Pratchett here: no, for once this is actually a fair attempt to describe a writer's style and concerns. Benn has a touch of Adams's humor, his prose control, his economy of action, his distance, and his flashes of piercing and painful humanity that shine so starkly in fictional universes that do not otherwise admit a great deal of psychological introspection. The patter is familiarly, comfortably Adams-ish in its easy confidence: "If you have a very very very powerful telescope and you point it at the space between the second and third stars on Orion's Belt on a very clear summer's night, you still won't be able to see the distant orange-green planet of Fnrr" (p. 8). The book seems to know it's decently written and amusing, and thus to not be overly anxious about itself. If Benn seems a bit more like an evocation of Adams than like someone who's bringing his own voice to the table at the moment, well, that is what one's first few novels are for. And far better a credible Adams-esque novel than something that can't manage such a strong imitation, or which thrashes about in paroxysms of anxiety of influence and ends up sounding like nothing much at all. Already there's a softness to Benn that gives his writing a different texture than Adams's. I'm tempted to call that softness sentimental, but I waver on whether I can ascribe that word to the tone, and to one of the novel's key turns, when it seems simultaneously true and undeservedly trivializing. Terra is not flawless. As I mentioned, there's that sentimental turn at the aforementioned pivotal moment that I both like and am a touch repulsed by. The novel also invokes the now well-worn "aliens discover fictionality, which is entirely new to them!" trope. This always feels to me like something you can only take seriously if you don't grok the inextricable connections between fictionality, speculation, and the hypothetical thought necessary for science, deception of any kind, or simply the presentation or reception of any complex idea that could have multiple valences and readings. The idea that, say, all users of language do not deal in fictionality, much less all scientists/philosophers/artists/etc., was dumb when Catherine Gallagher said fictionality as such was invented in the eighteenth century with Robinson Crusoe , and it's dumb in SF (except in Galaxy Quest , where it is lovely, because everything in Galaxy Quest is lovely in the way everything the light touches is Simba's kingdom, because that is just how things are). Given that SF as a genre often vaunts itself on its capacity to serve as a vehicle for rigorous thought experiment, it is perhaps extra dumb to try and pull "Aliens Don’t Know About Fiction" without Galaxy Quest 's genre awareness and thick lashings of irony. Conversely, I think the book attempts a criticism of one of my all-time SF pet peeves. Remember all the times in Star Trek when some alien race shows up and bemoans the primitiveness of humans, because we're, like, violent and stuff, and decides the way to deal with this is by . . . being violent to and belittling the humans? As though this in any way demonstrates the supposedly advanced nature of the beings in question? The show always seems to glow smugly after these denunciations of humanity, like it expects a pat on the back for being bold enough to show us our collective rubbishness in a mirror. But doesn't this limited depiction of what it would mean for a "developed race" to interact with a "less developed race" simultaneously offer little salient criticism and portray the imperialist model of interaction as essentially correct, because it’s how beings far in advance of even our Star Trek -selves roll when confronted with the (Perceived-as) Lesser Other? Through Terra's father Lbbp's evolving opinions about humanity, his mistaken harsh judgments, Fnrr's twin realizations that they might have something to learn from the humans they detest and that they themselves have not entirely evolved past violence, and the somewhat-crap nature of the novel's even-more unimaginably advanced elder race, the FaZoon, I get the impression that the paradigm of "advancedness" is being answered and destabilized. I'm not certain that this criticism ultimately coheres, because the challenges to the paradigm of advanced asshatdom seem to be situational, rather than addressed at the paradigm itself. But even so, such an approach is by no means valueless. What worries me most about this novel is that there are going to be two more in the series. That might sound strange, given that I liked Terra very much and that I'm looking forward to seeing more things from this author. It's just that I'm not sure that the marketing technique of The Series is right for all projects, and I don't know if Terra wouldn't have been better off as a slightly more substantial single novel that tied off its few remaining loose ends, rather than a distended Continuing Adventures. In a way this is a coming of age story, at once for Terra and for the relationship between these two worlds, and the beauty and tragedy of coming of age is that you can really only do it once.